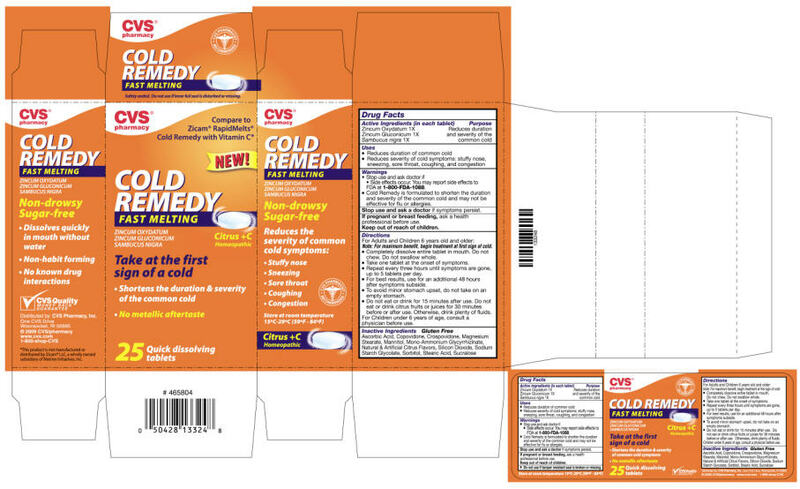 Cold Remedy is formulated to shorten the duration and severity of the common cold and may not be effective for flu or allergies. Note: For maximum benefit, begin treatment at first sign of cold. Completely dissolve entire tablet in mouth. Do not chew. Do not swallow whole. Take one tablet at the onset of symptoms. Repeat every three hours until symptoms are gone, up to 5 tablets per day. For best results, use for an additional 48 hours after symptoms subside. For Children under 6 years of age, consult a physician before use. Distributed by: CVS Pharmacy, Inc.